Images from the Himalayan Kingdom of Bhutan, the country where Gross National Happiness is more important than GDP. 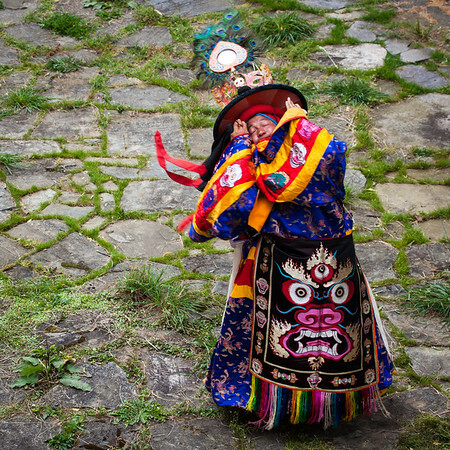 These images focus on Bhutan’s unique culture, where Buddhism is the predominant religion and driving force for most of the population. 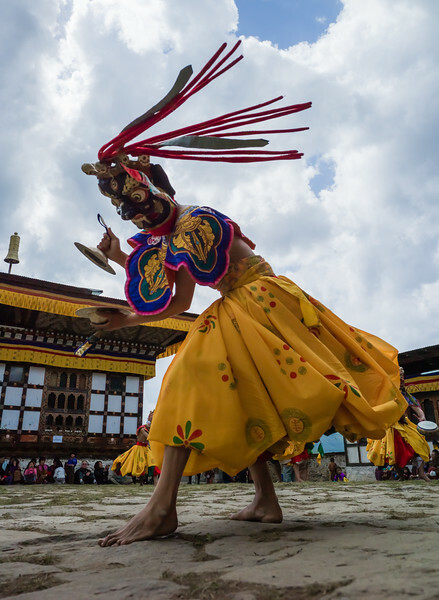 It is extremely difficult to describe the religious and cultural dances that are performed in Bhutan. 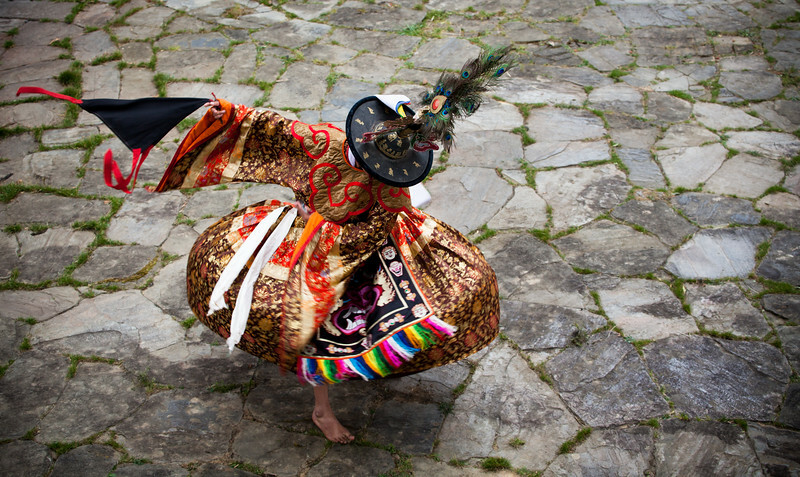 They take years and years to master, involve wearing heavy costumes, and are performed on difficult surfaces barefoot. Despite all that is entailed, the performers seem to be a peace when performing. Case in point is this image from Ogyen Choling, probably the place where I took the most images in a single day ever. Shooting from an open window on the second floor of building on the periphery of the courtyard, I was able to capture this dancer during a rare moment when he was relatively stationary. I think his face says it all: complete and utter serenity, despite the fact he's been dancing around the courtyard for several minutes. The fact that his costume shows a great dragon head makes it that much better. In May 2012, while I was in Bhutan, the King got married. The ceremony was extremely elaborate, and occurred both in the capital city of Thimphu, and the ancient dzong of Punakha. Punakha Dzong is the second oldest and second largest dzong in all of Bhutan, and it had been cleaned, scrubbed, and decorated as maybe never before in preparation for the royal wedding. What an incredible time to visit. Deep in the dzong complex is a small courtyard with a steep set of stairs. The courtyard looks like any other, and the stairs don't hint at the incredible scene that awaits those who make the climb. I did, and was greeted by intricately carved wood pillars, colorful wall murals of deities, and two huge golden prayer wheels. 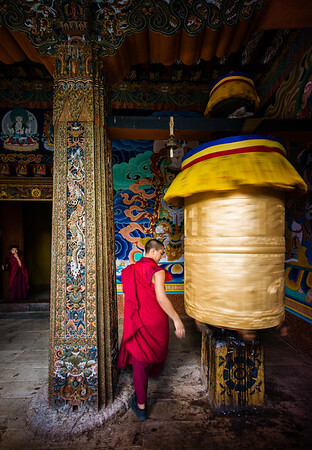 After a few minutes a young monk came out and walked around the prayer wheel while spinning it; a second monk stood in the far doorway watching. While the monk started spinning the wheel without any prompting, he was kind enough to do a few more rotations when asked. 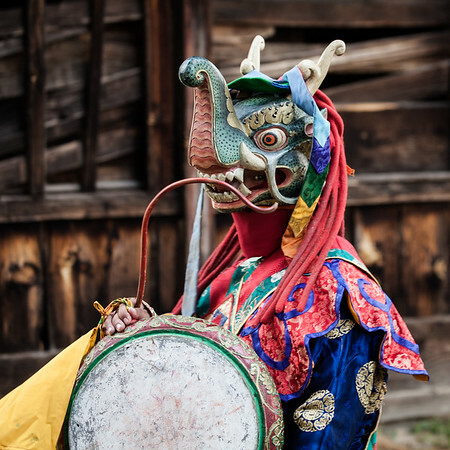 This photo is one of my favorite from that trip, and was even published on the front cover of Bhutan's 2012 Tourism magazine. The Kyichu temple, in Paro, is one of the oldest temples in Bhutan, originally built the 7th century. The inside of the temple, where photography is not allowed, is great to see. But, I had more fun exploring the exterior of the temple, with many pilgrims visiting and circumambulating it. The exterior of the building is lined with these small prayer wheels, each filled with thousands of Buddhist prayers. 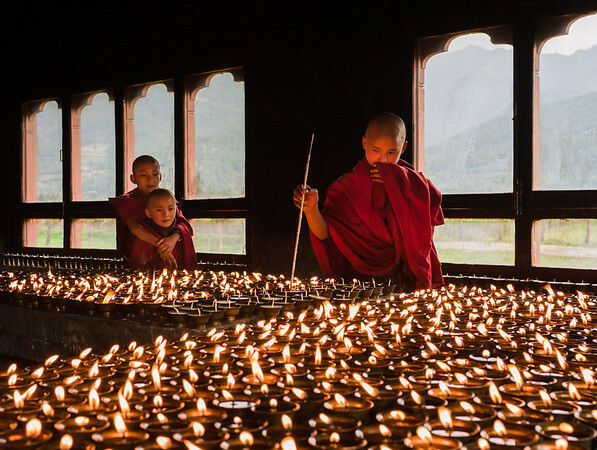 An individual will walk around the temple, turning each prayer wheel in succession, and thus say thousands and thousands of prayers as they work their way around the building. While I usually don't combine color with black and white, I made an exception for this image. 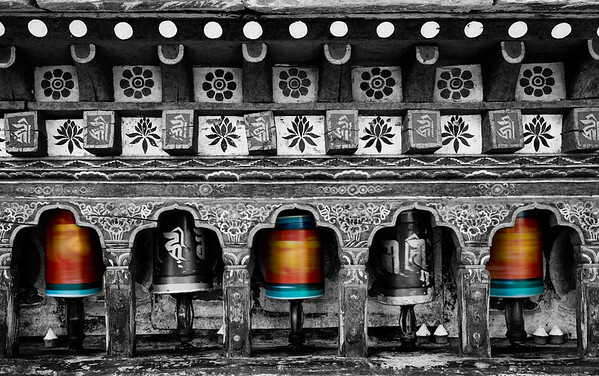 I thought the color accentuated the spinning prayer wheels, while the black and white of the stationary objects helped represent the age and ancientness of the structure. While we can't see the dancer's face in this image, which would surely show deep concentration, we can see the power, beauty and fluidity of the dance. Here we see the dancer in mid twirl. The dancer's right foot planted firmly to the ground below, and the other beginning its swing around the body, led by hid arms. I especially like how the dancer's robe is extended outward by the high speed of his turn, the extended right arm, and the lines created by the hat and slate background. On my first trip to Ogyen Choling, I was enamored with this old wooden wall. The weathered boards ran in different directions, each with a deep texture and color. I wanted to capture images of dancers in front of the wall to provide a unique backdrop. Not only did that happen for this image, but I also exposed the image in such a way that the dancers eye can just be seen inside the mask. 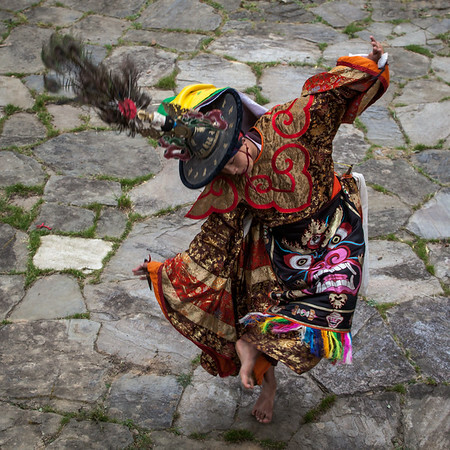 The Black Hat dance is one of the great Bhutanese dances, usually performed by monks. 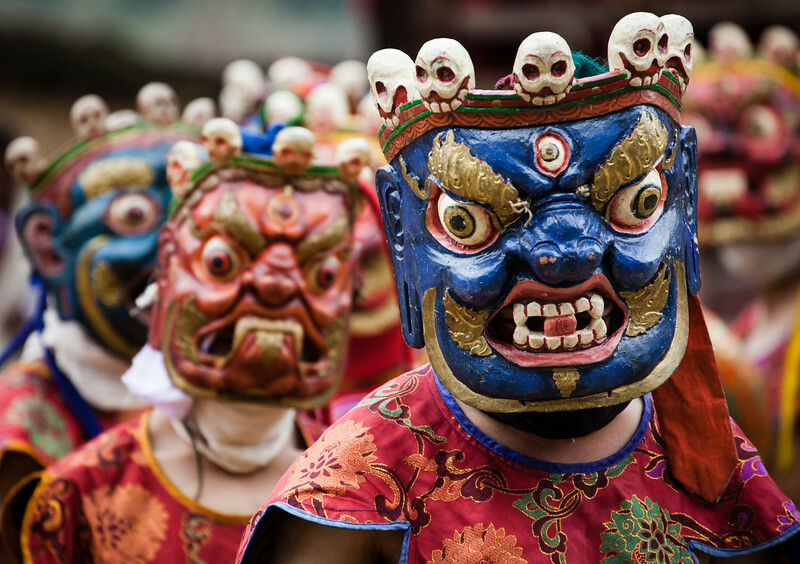 Getting its name from the headpieces worn by the performers, it supposedly celebrates the assassination of the Tibetan King Langdarama in 842 but a Buddhist monk wearing a black robe. The dancers assume the appearance of yogis who have the power of taking and recreating life. It is a powerful dance, and one that is incredible to watch. In fact, I'd say rather than "watch" the dance, one actually "experiences" it. 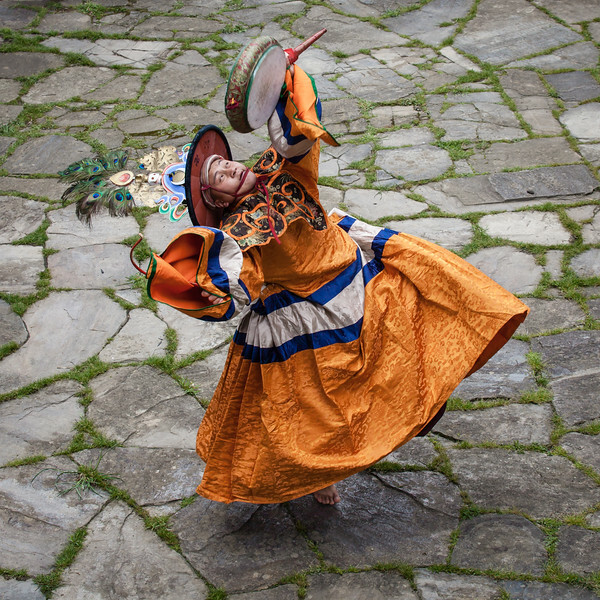 While this dancer isn't wearing a black robe, they do have the black hat on, with this Tibetan/Dzongka script encircling the top of the brim. These dancers move with incredible speed, making it a challenge to capture them in a specific moment. But, when everything comes together, one can get a glimpse of them, their movement, and their concentration. 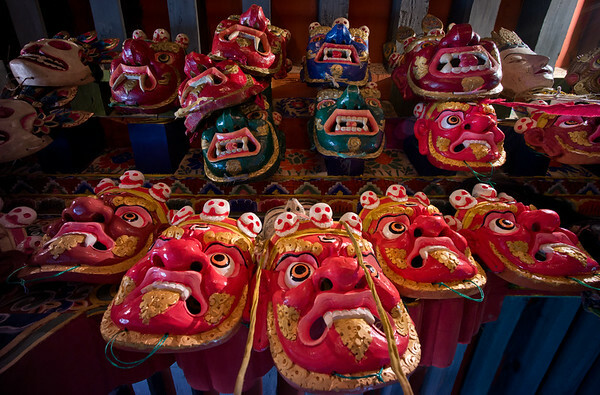 Located on the second floor of a temple in Phongmey, a remote village in eastern Bhutan, you wouldn't see this masks if you just looked into the room from the entrance. I didn't see them from that viewpoint. It wasn't until I was led into the temple room, up to the alter and told to turn around and look up that I saw these amazing masks hanging from the ceiling. The entire length of the ceiling, just in front of the alter, was covered with intricately hand carved wooden masks. The ones depicted here, skeletons, animals and more were all present, each showing minute detail. I got as close as I could to the alter, put my widest angle lens on the camera, and shot upwards into the masks. There was no way to shoot them straight on, so I had to make due with this angle. But, after seeing it later on my computer and in print, I really like the way it turned out. I arrived at the Temple of the Devine Madman (yes, that is an actual temple; I didn't make it up) after a short hike up the hill. The views from the hilltop were great, and then I stepped into the temple courtyard. After exploring the courtyard for a few minutes, I came upon this a makeshift classroom. It was just a covered area off to one side, no glass in the makeshift windows, no door in the doorway. 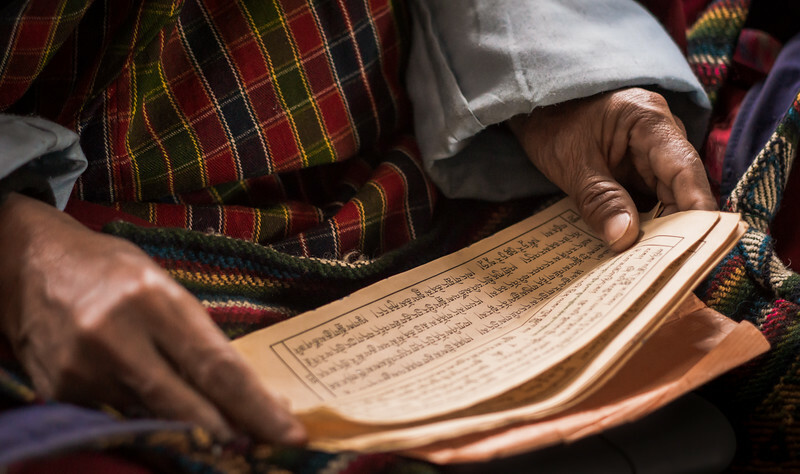 There were no students in the classroom, so I removed my shoes and walked over to these pages of Buddhist prayers, printed on the traditional long rectangular paper, and stacked hundreds thick. The pages were lightly wrapped in the red and maroon fabric, but appeared to have been casually placed that way. 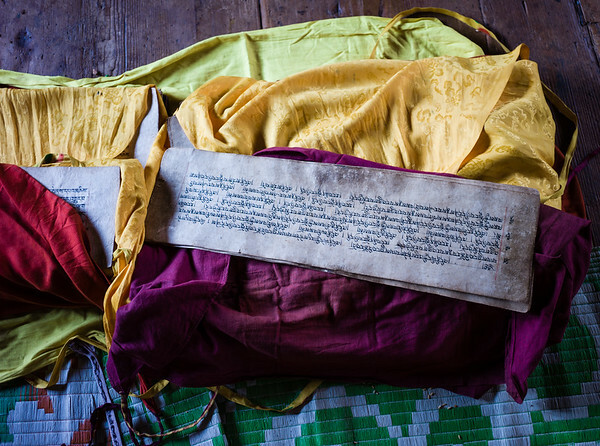 I carefully pulled back the maroon fabric to expose the paper and Dzongkha script, and stood almost directly over the stack to get this image. One of the small aspects of it that I really like are the grains of rice on the underlying mat; a snack eaten by a studying monk. One of the great things about visiting Bhutan is witnessing and taking part in the local festivals. In many cases these festivals have been going on for centuries, each generation teaching the next about the dances, symbolism, and traditions. It's a bit hard to photograph these festivals since one has to remain along the perimeter of the action. But, with a long lens many unique angles and perspectives are possible. I watched the action for a few minutes to try to get an idea of how the performers were going to move around the courtyard, and then I got into position. I wanted as many masks in the frame as possible, and that's what I got. They only lined up like this for a few seconds, but that was enough. These masks are true works of art, each hand carved and painted. Can you image a robe with more vibrant color? I've seen lots of religious and cultural garments from around the world, but those from Bhutan are among the very best. 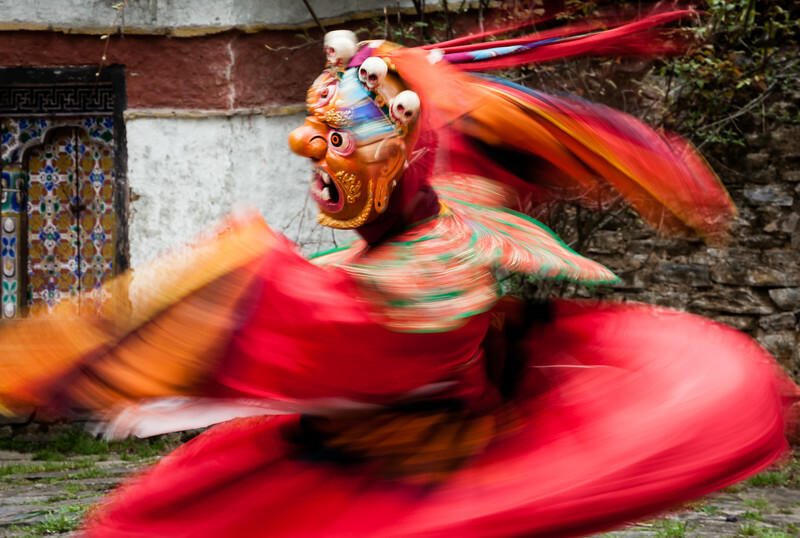 This gentleman, part of the national dance troupe of Bhutan, had been performing for an hour or so by the time I captured this image, but it looks like he just started, full of energy and grace. This was one of several dances performed for us that day, and probably my second favorite (the Mask Dance is pretty hard to beat). The choreography, music, and drum strikes--all of which are impossible to show in a photograph--were simply incredible. What captured me in this image is his body position. One foot firmly planted on the slate covered ground, the other in midair yet hidden from view. The drum held high over the head with the red curved drum stick held opposite, ready to fly towards the drumhead at the precise moment dictated by ancient dance. Put all of that in front of the beautiful backdrop of slate and thin lines of green grass, and it made a unique image. During a private festival in Ogyen Choling, I finally captured an image I had been trying to capture for quite a while. These dancers spin around very quickly, but as with ballet, their heads are usually pointed in one direction to keep them from losing their balance and orientation. The goal was to capture a sharp face, but get the body in motion. I think this is about as good as it can get given the shutter speed that has to be used to capture the motion. I'm very happy with this image, and it brings a smile to my face each time I see it. Once you've seen a few Bhutanese festivals, the fun thing becomes trying to photograph it from a new angle or perspective. To do that, I put a wide angle lens on the camera, set the focus to the hyper focal distance, and then basically put the camera on the ground angled up to capture the dancer as he came towards me. This dancer was probably only 2-3 feet from my lens when I pushed the shutter, and with the camera on the ground I could not frame the shot at all; I was relying a lot on luck for this image. All in all, it worked out well and provided a unique perspective on a traditional Bhutanese dance.